Ernst Glas takes his family on summer cruises on the Baltic Sea aboard RONDINE, a 43′ sloop his father built in the early ’90s. He’d had a rather disagreeable tender for the yacht, too heavy to haul up on deck and powered with a rather unreliable two-stroke outboard that required “a lot of begging and praying.” He sold the tender, but his young son Tristan missed the boat and pleaded with his father for a new dinghy. Barb, Eric, and Gene brought the unfinished kayak home to Waukesha to complete it. At the launching they dedicated the boat to Hal’s memory. and christened it KUPENDANA, Swahili for Love One Another. After their first outing, Gene suggested paddling the Mississippi River – all of it – from its source in northern Minnesota to the Gulf of Mexico. Even though Eric was now in college and Barb was retired from teaching, she had trouble embracing the idea. But then, during a Sunday sermon, Barb and Gene were both inspired to incorporate an element of service to the communities along the route. They would make their river travel a manifestation of Kupendana. Barb and Gene dehydrated food, mixed ingredients for meals, gathered equipment, and made contact with service organizations along the 2,000-mile route they had planned for their 6-month voyage. Last year, Curt White of Saluda, North Carolina, made some even more dramatic modifications to his Escargot, BEULAH, creating a well-appointed living room afloat. He and his wife Debby had lived in Charleston, South Carolina, for 30 years. To take advantage of the rivers and backwaters that surround the city, they had five boats ranging from a 10′ sailing pram to a 25′ outboard cruiser. When the two retired, they moved inland, trading the coast for the mountains surrounding Saluda, North Carolina. Building a boat was on Curt’s “bucket list,” so he and Debby kept an eye out for designs that would be well suited to the mountain lakes near their new home. The review of Escargot in the April 2015 issue of Small Boats Monthly provided just the inspiration they were looking for. In 2016 and at 72 years old, with retirement from a career in IT management in the offing, Bob was seeing an opportunity to finish the project. That worried his wife, Beth. She imagined the dinghy setting sail from their vacation home on the shore of Lake Mooselookmeguntic, a sprawling wilderness lake in Rangeley Lakes region of western Maine. The lake is subject to sudden storms that can bring high winds and waves over 3′ high. Beth noticed Bob poring over a pair of WoodenBoat articles about the Jericho skiff, another one of White’s designs. The 15′ 6″ outboard skiff seemed to be a better choice for the lake—she saw her opportunity and surprised Bob with a set of plans as a Christmas gift the year before his planned retirement. Gary Strombo of Everett, Washington, told his friend John Leyde that he wanted to build a boat. As often happens, the moment you speak of your wishes to someone else, the momentum to carry them out begins to build. Gary had had no experience building boats, but John got his start decades ago and had several boats to his credit, including two electric launches and a diesel launch that he later converted to steam power. 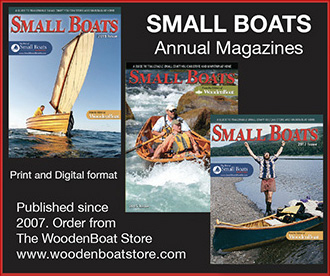 Gary had taken an interest in Adirondack guideboats and found plans and instructions for a strip-built version in Building an Adirondack Guideboat by Michale Olivette and John Michne. The Independence Seaport Museum sits on the banks of the Delaware River in the heart of downtown Philadelphia. Like most museums, it preserves artifacts of the past, but the Independence Seaport Museum is also preserving skills. It has an active boatshop, Workshop on the Water, that is bringing the traditions of wooden boat building to the city’s youth. Among the programs at the shop is SAILOR—Science and Arts Innovative Learning on the River—for middle and high-school students. Groups of 10 to 14 students build small boats learning STEM skills (Science, Technology, Engineering, and Mathematics) and the boats go to the museum’s community boating program fleet. David MacLean purchased the plans for the Old Sailing Peapod from the Smithsonian and used the lines as the starting point for his tender. At 15’ 3”, the original was a bigger boat than he required; he opted for an overall length of 13’ 6”. He also decided to strip-plank the boat to save on the weight of the original lapstrake construction. Steve Judson of Annapolis, Maryland, was thinking seriously about building a Scamp. His wife had given him the plans for Christmas and he had thought highly of the Scamp’s performance during a test sail. But he had his heart set on a boat with a mizzen so he could more easily heave to. He did a bit of research and discovered that John Welsford had designed another boat with a hull very much like that of the Scamp, but longer and equipped with a mizzen.